Preppers. Survivalists. Bex prefers to think of herself as a realist who plans to survive, but regardless of labels, they’re all sure of the same thing: a crisis is coming. And when it does, Bex will be ready. She’s planned exactly what to pack, she knows how to handle a gun, and she’ll drag her family to safety by force if necessary. When her older brother discovers Clearview, a group that takes survival just as seriously as she does, Bex is intrigued. While outsiders might think they’re a delusional doomsday group, she knows there’s nothing crazy about being prepared. But Bex isn’t prepared for Lucy, who is soft and beautiful and hates guns. As her brother’s involvement with some of the members of Clearview grows increasingly alarming and all the pieces of Bex’s life become more difficult to juggle, Bex has to figure out where her loyalties really lie. In a gripping new novel, E. M. Kokie questions our assumptions about family, trust, and what it really takes to survive. E. M. Kokie is the author of Personal Effects, an American Library Association Best Fiction for Young Adults selection. She lives in Madison, Wisconsin. Kokie writes with nuanced sympathy, condemning the government’s heavy-handed tactics and Bex’s tunnel vision, contrasting her need for self-sufficiency with her desire to belong, and examining gender identity and sexual orientation. It’s a complex recipe of volatile ingredients that Kokie uses to deliver an unsettling story that’s both timely and necessary. Readers of all sexual orientations will relate to Bex's intoxicated blend of nerves and anticipation regarding Lucy...Kokie takes her time developing characters and setting the plot in motion, creating a believable lesbian protagonist who wants to belong to a world that doesn't particularly want her. A hard, cleareyed look at coming of age in a prejudiced world. Kokie’s legal background lends verisimilitude and fascinating insight into prison life and legal strategy, while swift pacing pulls the reader deep into multiple plot twists. However, it’s Bex’s passionate, uninformed, awkward naïveté that drives the novel. Kokie’s sympathetic and believably flawed heroine’s first-person, present-tense narrative offers an intriguing portrait of a philosophy not often explored in teen fiction. Bex’s complex relationship with Lucy is particularly well depicted, but even secondary characters are well-handled. This is a different kind of dystopia, where the threat to survival comes from an unexpected quarter, and the kickass girl has to save herself instead of a whole world. Give this to readers intrigued by the complex psychology of girls who don’t fit the traditional molds. 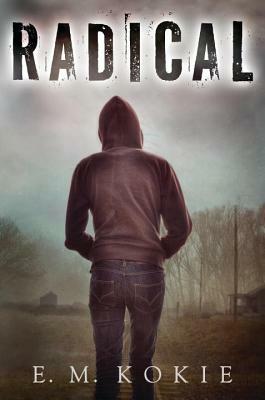 Radical is an intriguing novel featuring an LGBQT protagonist that challenges readers’ assumptions about family, trust, and what it truly takes to survive. Highlights include a unique main character, her acceptance of her identity, and the struggle of her family to accept her as she is. The premise of survival based on perceptions from the inside out will engage readers, especially with a militia theme scarcely explored in young adult fiction. Readers are sure to be drawn in by Bex’s unusual perspective and her heart-wrenching, timely story. Kokie does an excellent job of tethering the reader firmly into her perspective, so that her revelations are our revelations. "Radical" offers both a suspenseful storyline and an in-depth exploration of what protecting oneself truly means.